MMA Girls Can Express Themselves! 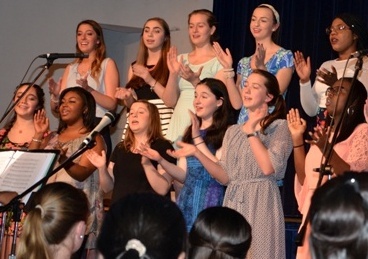 We encourage students to find their own creative voices at Merion. Through a myriad of artistic outlets, they can have fun and learn more about themselves and our world through creative discovery and expression. If Art or Music is a true passion or career pursuit, we also offer majors in both areas, as early as Sophomore year. Want to try your hand at drawing, painting, 3D-design, or sculpting? Does performing with a beautiful instrument fill your heart? Like to sing out loud with glee, a cappella, or liturgical groups? Is acting on stage or decorating a set a main interest? Or do you love to kick it with dance troupe or on a dance team? We have all that and more for you to enjoy!